The beginning of the year saw the announcement of a new technology hub for all techies, hackers, investors and tech companies. The announcement was made by Erik Hersman (Hash) who runs the blog Whiteafrican , which focuses a lot more on technological advancements in IT though he terms it as a white African's view of the world. February 3rd marked day one of the Mobile East Africa Conference  (MWEA10) held at the KICC in Nairobi. The 2 day event was aimed at harnessing the potential of the internet and applications on mobile devices. It was attended by various mobile developers,mobile company CEOs as well as other stakeholders in mobile telephony. Hash did a stream post  of the conference while attending. Kachwanya also covered the the conference in his Ten Conclusions  blog post. White African and Mworia  have also written posts on this ongoing event. Pan Africa Media Conference 2010  an event being organized by one of Kenya’s biggest media houses, the Nation Media Group  is set to take place in Nairobi on the 18th and 19th of March. Ory Okolloh,  a blogger and one of the forces behind Ushahidi – a crisis crowd sourcing project, will be the moderator. 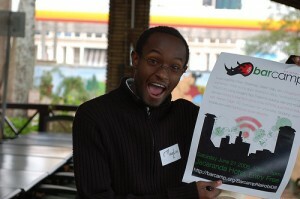 Plans for Barcamp Nairobi 2010  are in top gear with tentative dates of either 26th March or 12th – 13th June being voted for on the PBworks page. Lastly, Maker Faire Africa  is coming to Kenya on the 6th & 7th of August this year.